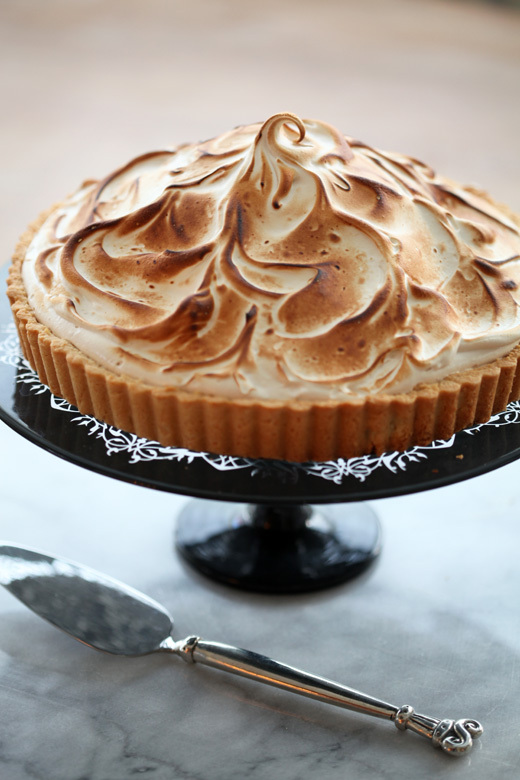 This tart is the cousin of the Lemon Meringue Pie, an all American classic. The lemon is intense, smooth and bracing, which is the perfect contrast to the pillowy brown sugar meringue that floats on top. They sit on an almond pastry crust that is tender and not overly sweet. The filling is simply made with just lemon juice, egg yolks and sugar, no need for cornstarch or sweetened condensed milk. 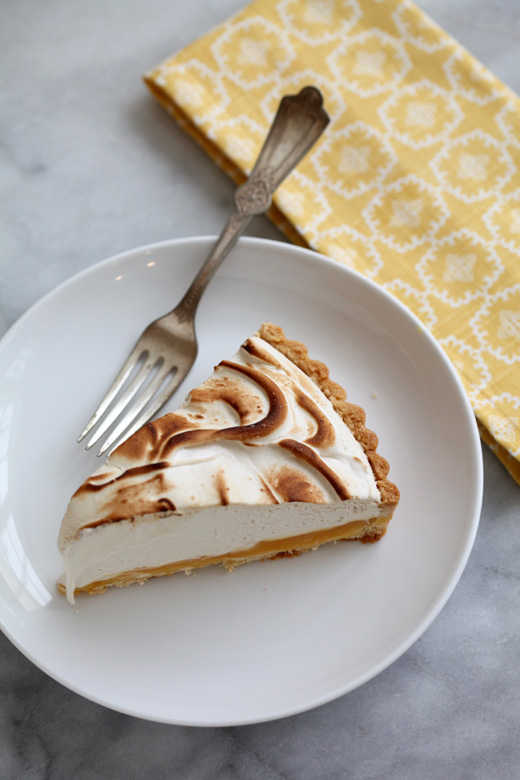 The brown sugar in the meringue gives it more personality and a deeper flavor, which goes so well with the sourness of the lemons. 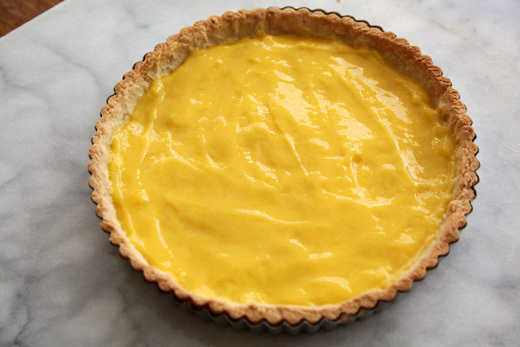 A lemon tart is a bit untraditional for the holidays, but I find it a wonderful addition to a Christmas buffet. It looks festive and is a nice contrast to the Bûche de Noël, a Christmas Stollen, Panettone and all those cookies you have been baking. 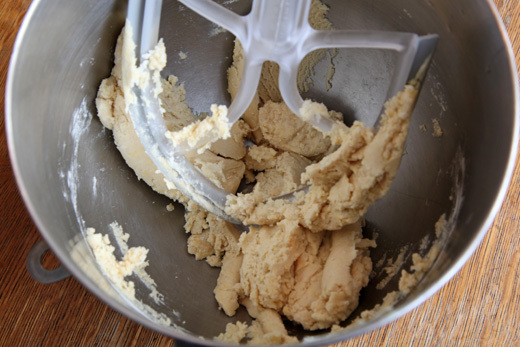 Make the almond tart dough: In a Stand Mixer cream the butter and sugar with the Beater Blade. Then add the yolk and mix to combine. Add the flour and salt, blend until it comes together. You can immediately press the dough into a 9 to 10-inch Tart Pan with Removable Bottom or form the dough into a disk and wrap it in plastic. Refrigerate for at least an hour. 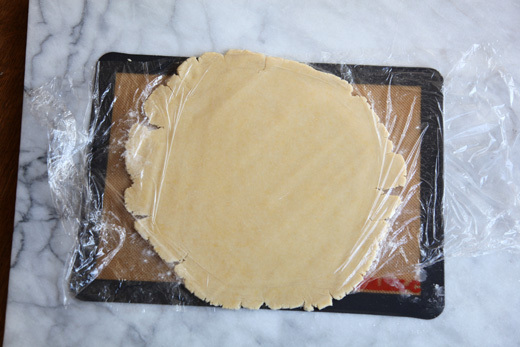 Roll out between a Nonstick Silicone Baking Mat (or wax paper) and a sheet of plastic wrap. 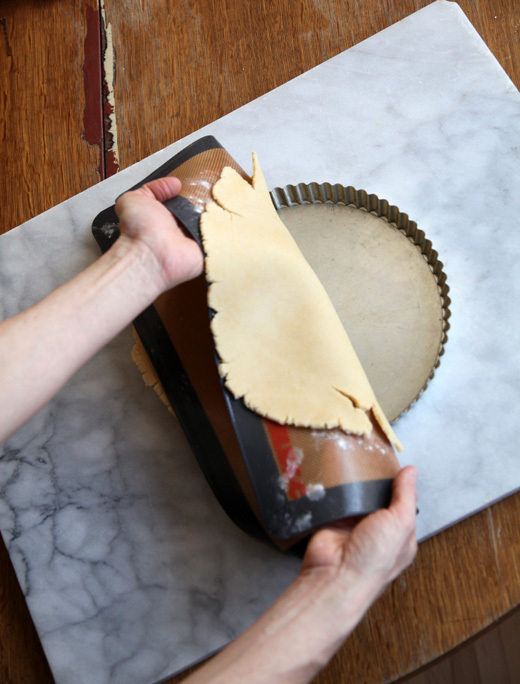 Use the silpat to pick up the dough and drape it over the tart pan. The dough will certainly break apart and you will have to press it into the pan, but by rolling it out you will have a uniform thickness. Scrape off the excess dough from the top of the pan. 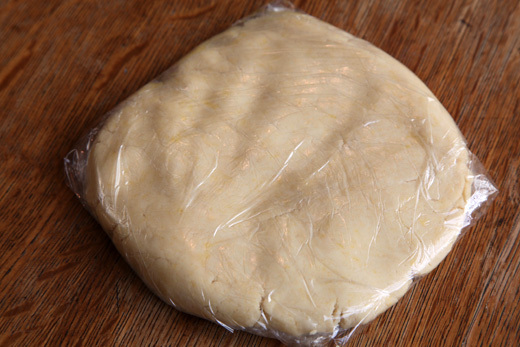 Freeze the dough for about 15 minutes while the oven preheats to 350 degrees. 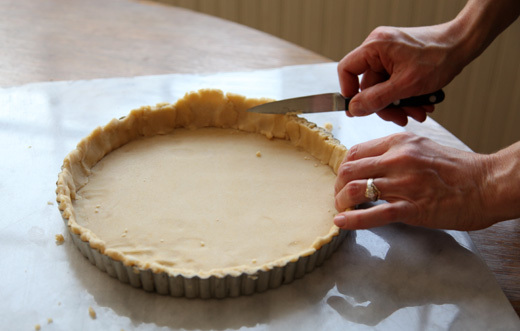 Fill the tart shell with foil and baking beans or Pie Weights . Bake for about 20 to 25 minutes or the crust looks golden on the edge. 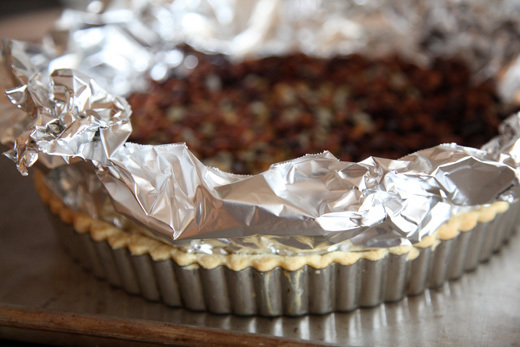 Remove the foil and continue to bake until the tart shell is golden on the bottom. 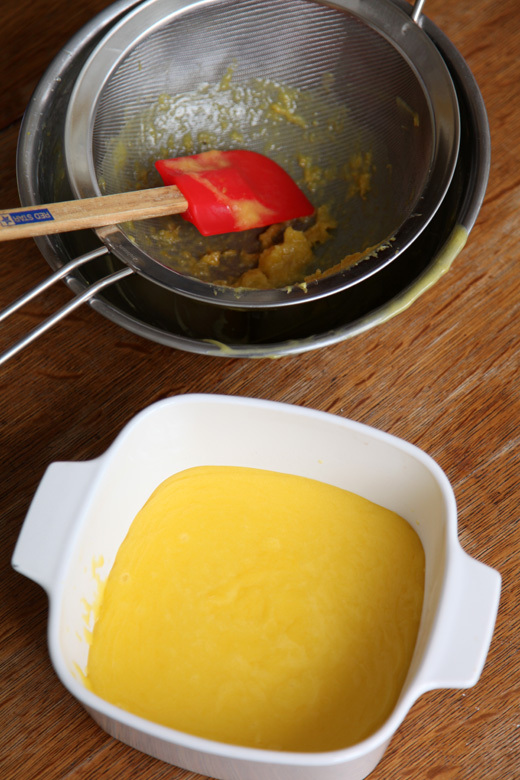 Make the lemon curd: Put the lemon sugar, yolks, juice, zest, butter and salt in a large bowl. 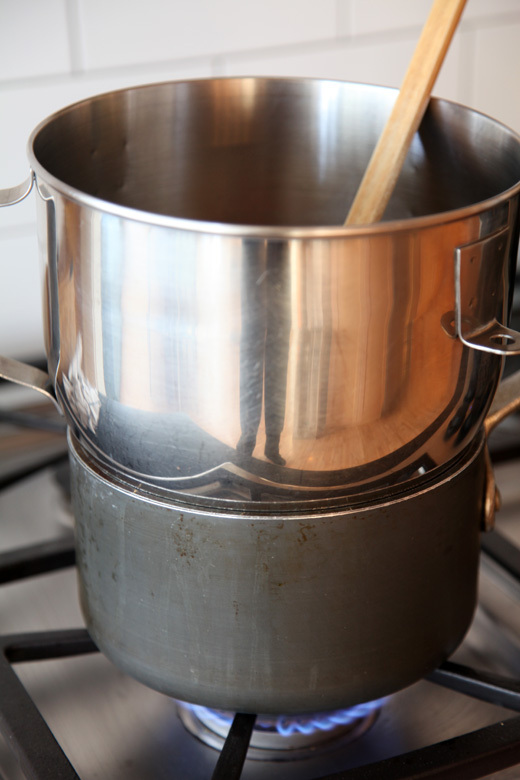 Place the bowl over a pot of simmering water to form a double boiler. 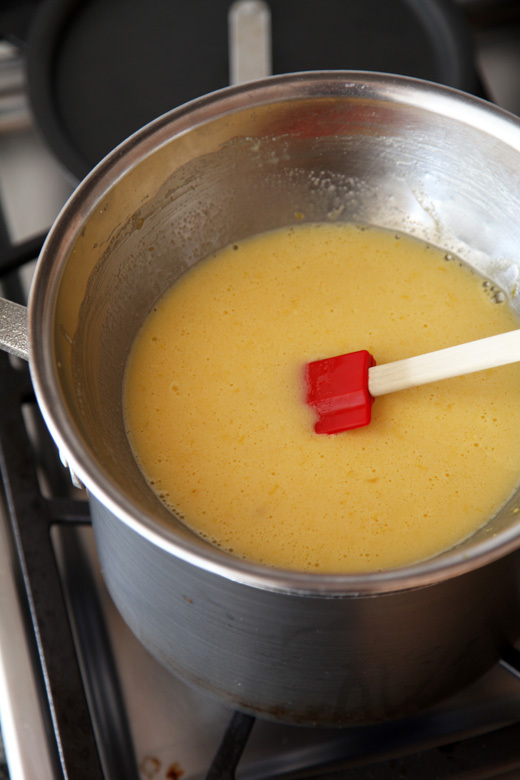 Stir the lemon curd with a Heat Resistant Spatula until the curd is thickened, about 10+ minutes. The curd will stay put when you run your finger through it on the spatula. Strain the curd through a Fine Mesh Strainer , then cover with plastic wrap and refrigerate. Once the curd is cool you can fill the tart shell. 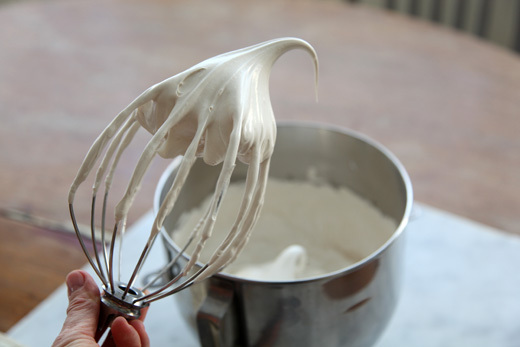 Make the brown sugar meringue: In the clean bowl of a stand mixer stir together the egg whites, brown sugar and salt. 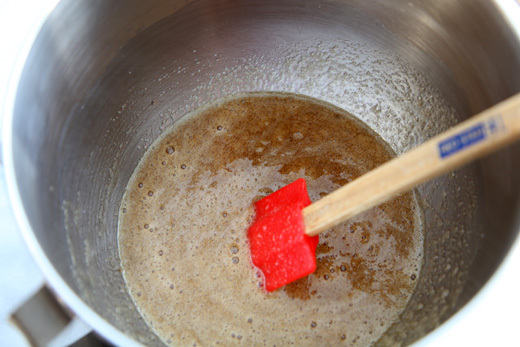 Stir the mixture over a double boiler until the sugar is melted and there is no more grit when you rub the mixture between your fingers. Place it on the mixer and whip until the mixture is room temperature and fluffy. 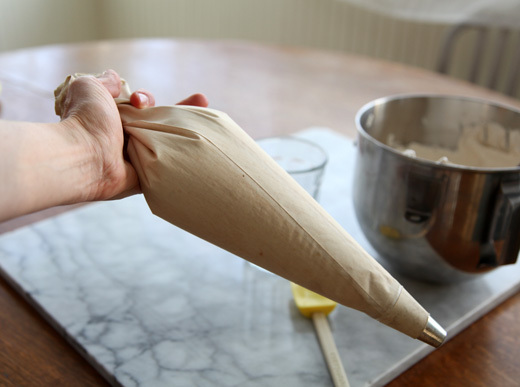 Fill a large Pastry Bag, fitted with a Large Round Tip. 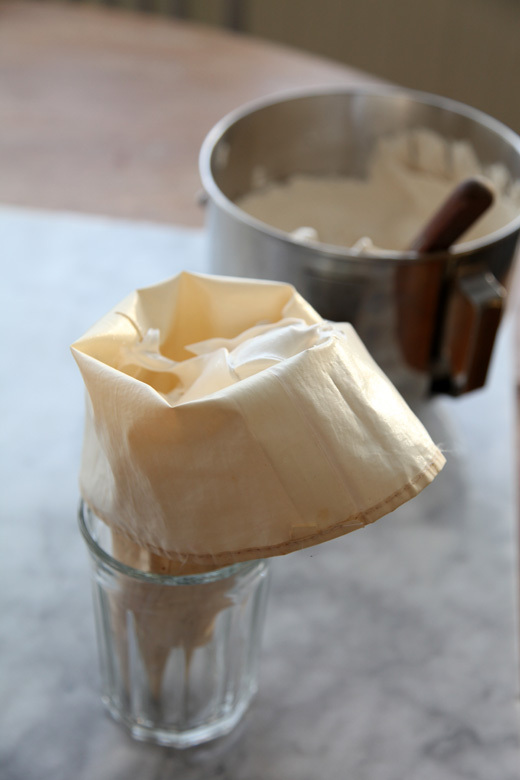 If you are not used to working with a pastry bag you may want to rest it in a tall glass as you fill it, make sure the top is folded down so the outside of the bag doesn’t get sticky. Once the bag is filled twist the top of the bag so that the meringue doesn’t come out of the top. 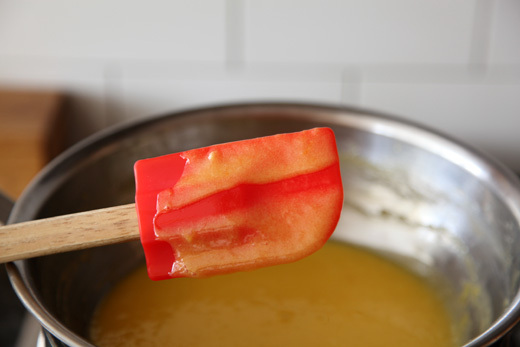 cover the lemon curd with the meringue and then use a Spatula to make ripples in the surface. 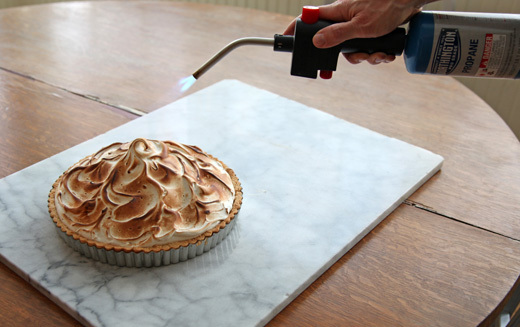 Once you are happy with the design then use a blow torch with a Trigger Start to toast the meringue. You can also do this under a broiler, but you have less control and the crust may get toasted as well. The toasted meringue smells and tastes like a marshmallow that has been in a camp fire. 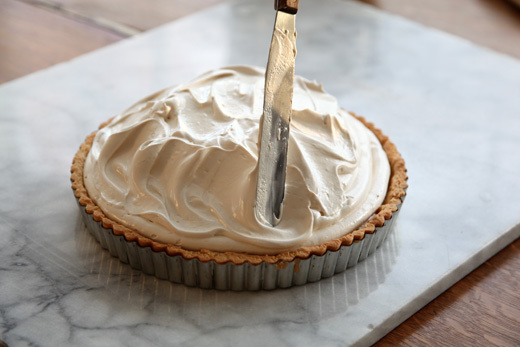 Use a very thin knife that has been dipped in a pitcher of hot water to cut the meringue. Wipe the blade clean after each cut. i just really don’t know if a more perfect dessert could ever exist! 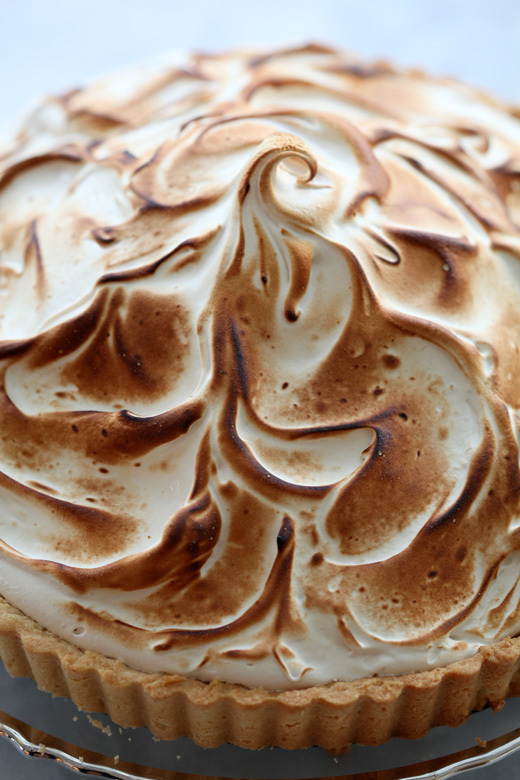 The meringue looks and sounds fabulous. Would love to give that a try. Well isn’t that just lovely. 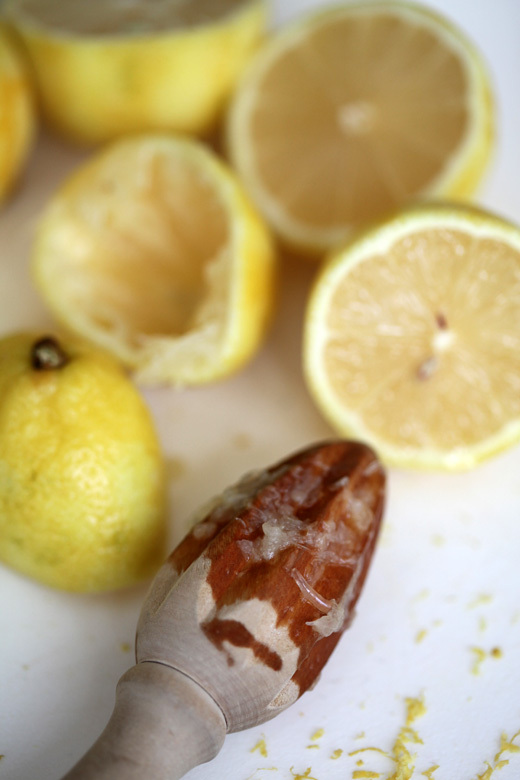 I just may have to pick up some Meyer lemons and whip this up for the holidays. That one looks almost too pretty to eat. Almost. Beautiful presentation. I can taste it. I’ve purchased the almond flour at Trader Joes and used in crust. Nice touch. zoe – Do you have a link to a recipe for chocolate dipped salted caramels? I’m thinking that’s the “in” gift food item for holidays. Or without the chocolate that you’ve tried. thanks. Happy holidays to you and your sweet clan. Nostalgia – I grew up eating this lemon meringue pie except my mother made a dough crust – she was a wonderful baker and the taste of this lingers to this day – will have to give in and bake one soon. Thanks for the memory, Zoe – all best wishes for a Merry Christmas and a Happy, Healthy, Prosperous New Year. Gorgeous and oh so delicious! A lot of delicous things have found their way across the side yard, but this one is over the top. Absolutely one of your best. Thanks for letting me verify IT REALLY IS ALL THAT. I love anything lemon, especially with meringue! My neighbor just called today to tell me that the Meyer lemons on their tree were ripe and that I was welcome to them- yay! Two years ago their tree had a bumper crop and I zested and juiced about 200 lemons! I still have some left in my freezer but they are almost gone so it’s time to restock! I’m a little confused about the lemon curd. You say to “Put the lemon juice, sugar, yolks and salt in a large bowl.” but there’s no mention of the rest of the ingrediants (butter, zest, salt). Nice catch, thank you! I fixed it to reflect ALL of the ingredients. This is gorgeous, Zoe. Wonderful photographs throughout; I especially like the one of the meringue coming off the whip lin stiff peaks – it has the perfect bird beak shape. Also your torch is SERIOUS. I really like your photo instructions, Zoe! This looks fantastic! Happy holidays, Zoe! oh, YUM! This looks so wonderful and pretty! I learned some tips from you on how to handle the dough. Also, how to use my Silpat in the process of moving it! THANKS! I must have stared at the top first pic of the meringue for atleast few minutes! It looks absolutely perfect! Thank you for the recipe! Looks delicious, Zoe. Wish you and your family a very happy new year. lovely: perfect on a glossy magazine cover…or on a cheerful and elegant dinner table! oK. This sounds absolutely delicious!! Sounds wonderful. I just wanted to check whether the meringue cooks all the way through just using a blow torch? I’ve had problems in the past with my meringue weeping and sliding off the curd, do you know what I’m doing wrong? There are three types of meringue; Italian, Swiss and French. The first two are cooked and the French is raw. The Italian meringue is the sturdiest of the 3 and therefore the least likely to weep. Swiss meringue is also cooked, over a double boiler, so it too is very sturdy. French meringue is the one you have to watch out for, in terms of weeping. That was a long way of saying this meringue doesn’t weep and lasts for a few days. … ooh! have a few Meyer lemons left – this one deserves them! 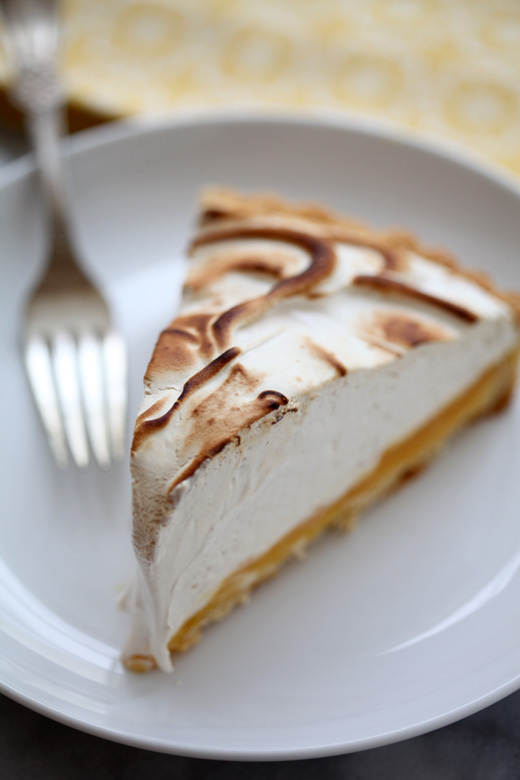 what a great riff on Lemon Meringue pie! I love the brown sugar flavor. Yum! Beautiful pie. What a wonderful recipe this is Zoe! Hats off to you I hope you don’t that I share this on a food recipe site ( but have given credit back to your site and you) I love the combination of brown sugar and meyer lemons in this. I so appreciate that you are enjoying the blog and want to share the recipes and links. I just ask that people don’t use my content or photography without asking. But, anyone can certainly make the recipes and take their own pictures. I love to see how people make the recipes and put their own flare on things. You really love meringue, eh? 😉 Like I do, so your blog is heaven for me! Happy Thanksgiving and a couple of announcements!